As Valentine’s Day approaches, you are probably thinking about the person you love the most. However, you shouldn’t forget about the furry friends that you love, too! During this holiday, AERA sees many pets that have gotten into common Valentine’s Day items that owners don’t always realize are hazardous. For this reason, AERA wants all pet owners to be aware of these five common Valentine’s Day pet hazards. Pretty much every pet owner knows that chocolate is a no-no. Since chocolate contains theobromine and methylxanthines, it is very toxic to pets. The chocolate you give or receive on Valentine’s Day needs to be kept out of reach of your cat or dog to prevent a variety of problems including gastrointestinal upset, elevated heart rate, hyperactivity, seizures, inflammation of the pancreas, and more. Enjoy your chocolate but keep it away from your pet. While you are popping the cork on your wine or champagne, it is important to keep an eye on your pet. Even a small amount of alcohol could be poisonous to an animal. Unattended glasses or spills could easily allow your pet to lap up a bit of alcohol. For pets, consuming alcohol can cause vomiting, diarrhea, tremors, lack of coordination, breathing difficulty, central nervous system depression, metabolic disturbances, coma, and even death. Valentine’s Day is romantic, and many people have flowers, candles, and other decorations in their homes. Without realizing it, you could be putting your pet in danger by leaving these items within their reach. Although flowers are beautiful, some flowers are toxic to our pets, especially cats. At Valentine’s Day, lilies and tulips are some of the main offenders. However, you should do a little research on pet-safe flowers if you are planning on sending flowers to someone who has a pet. If you receive flowers, you should keep them out of reach of pets. This could mean that you need to keep the bouquet in a room that your pet doesn’t have access to when you aren’t there to supervise. Even flowers that aren’t toxic could cause injuries to your pet. Roses and other flowers with thorns could cause puncture wounds on your pet if they bite, step on, or swallow a thorn. These wounds could also get infected. Candles are always dangerous to have lit around pets, especially when you aren’t there to supervise. When left unattended, your pet could easily burn themselves or start a fire by knocking the candle over. It is best to blow out candles when you can’t keep an eye on your pet. You probably wouldn’t think much about leaving a stuffed animal lying around on Valentine’s Day, but if you are a pet owner, these cute toys can lead to dangerous outcomes. Most stuffed animals aren’t made to be chewed on by pets. The inside materials, such as “beans” or stuffing can cause dangerous intestinal blockages. Additionally, hard parts like eyes and noses that are sewn into the stuffed animal can be choking hazards. Be sure that human stuffed animals are kept out of reach of our furry friends. Ingestion of wrapping paper and ribbons can be a big problem for a pet. When you unwrap a gift, make sure that all of the packaging is disposed of properly and that your pet doesn’t have the ability to ingest it. If your pet does happen to ingest wrapping paper or a ribbon, it could cause obstructions in your pet’s intestines. These blockages could require surgery. Your pet could also choke on these items, which could quickly become a very dangerous situation. It is impossible to watch your pet constantly, so if your dog or cat gets into one of these items around Valentine’s Day you should contact your veterinarian right away. If symptoms like choking, severe or extended vomiting, seizures, or difficulty breathing occur, you will need to bring your pet in for emergency treatment. Bring in the items or packaging of the item that you believe to be the culprit to better help the veterinarian treat your pet. Don’t forget to get your dog or cat a pet-friendly Valentine’s Day gift! 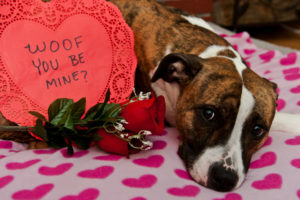 Pet chews, toys, and treats can make great Valentine’s Day gifts for the furry loves in your life. If you live in the Fairfield, New Jersey, area, contact AERA right away. We can be reached 24 hours a day, seven days a week a 973-788-0500. Our emergency clinic is open on holidays, including Valentine’s Day, to deal with emergency situations such as these.